The work breakdown structure defines the total project. A work breakdown structure is a product oriented, family tree composed of hardware elements, software elements, and service elements. The work breakdown structure relates project elements or work scope definitions to each other and to the end product. 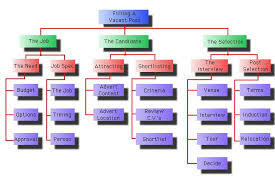 The work breakdown structure is not an organization chart of company personnel. It forms the basis for organization and coordination in the project. It shows the amount of work, the time required, and the costs involved in the project.. The work breakdown structure is the operative basis for the further steps in project planning, for example, cost planning, scheduling, capacity planning as well as project controlling. the project manager defines the key objectives first and then identifies the tasks required to reach those goals. A WBS takes the form of a tree diagram with the “trunk” at the top and the “branches” below. The primary requirement or objective is shown at the top, with increasingly specific details shown as the observer reads down. When completed, a well-structured WBS resembles a flowchart in which all elements are logically connected, redundancy is avoided and no critical elements are left out. Elements can be rendered as plain text or as text within boxes. The elements at the bottom of the diagram represent tasks small enough to be easily understood and carried out. Interactions are shown as lines connecting the elements. A change in one of the critical elements may affect one or more of the others. If necessary, these lines can include arrowheads to indicate time progression or cause-and-effect.